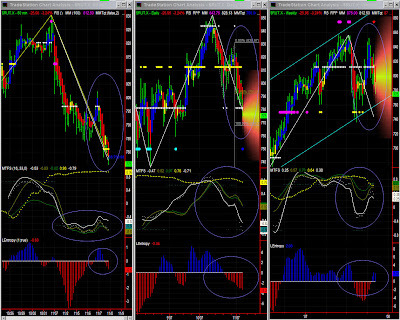 Yesterday's close below 781 may indicate RUT going lower, to much lower. A return to 750 is possible, with a first target around 767. One could possibly have a reprieve if RUT closes above 781 today, but MTFS and Entropy are quite bearish so it is unlikely. Entropy and MTFS indicate continuation of this situation of congestion with a downward bias. We can note that we are again very close to a key level at this time frame with the Swing indicator oscillating frequently.Same as SPY, divergence and a double top are to watched carefully now. The MTFS shape is not of a double top, so a broad trading range (roughly [750-875] is a more likely scenario for the time being. 60mins: Down, support to be found toward next MM+ Fib level. Always difficult to assess movements in both a very high volatility environment and so close to key levels. Lower time frames certainly helped a lot here.150 despite being strong broke, was tested again as a resistance, which is always an open door for bear who sold heavily in the last part of the day.We have 2 bearish Fib patterns both pointing for a first support level around 146. MTFS and Entropy certainly confirm this. Yesterday's scenario did not quite anticipate 150 to be broken even if we had negative entropy and a MTFS that didn't look too good. MTFS is certainly a lot more bearish now, so support can be found somewhat lower. 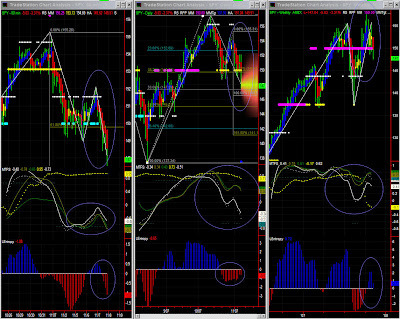 Fib levels to be checked carefully (both retracement and expansion levels). Entropy is not dramatically low, so we're not in any sort of crash or meltdown... i.e. no panic just yet. 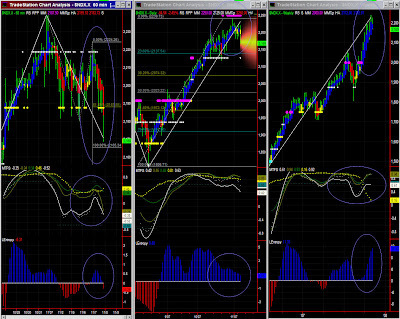 We've been warning about MTFS divergence and a possible double-top. The MTFS pattern is however not that of a double top as such, so one should not jump to conclusions just yet, but certainly remain cautious. I admittedly got it wrong here. I expected a congestion or a trading range [2188 - 2220] but certainly not the lower boundary to be broken so decisively. The Significance levels had dropped over the last few days, and lower time frames provided a clearer picture, which cannot be expressed on a daily snapshot.The bias is now down, but despite the high volatility, one should not expect any sort of fall or meltdown.NDX should find some support around 2165... or 2125! This down day is no more than normal congestion ahead of the strong 2250 resistance. The expected slowdown is now there, but we still do not have conditions for a major retracement right now. Having said that a support must be found lower.